Jurgen Klopp continued his excellent start at Liverpool with a 6-1 win over Southampton last night which saw the return of Daniel Sturridge in quite a rotated squad. Although their performance was perhaps not as good as the scoreline suggested, they still showed clear signs of improvement as they continue to impress following the German’s appointment. With a few changes in selection, Liverpool lined up in somewhat of a 4-1-2-1-2 formation. Young Randall was given a start in a back-line consisting of Skrtel, a returning Lovren and Alberto Moreno. Lucas Leiva formed the deepest point of the midfield with Can and Allen moving forward ahead of him. The duo looked to support Adam Lallana who occupied the 10 position behind goalscorers Sturridge and Origi. There was less change across Southampton’s squad with Koeman opting not to rest his key players. Stekelenberg was goalkeeper behind a back four of Bertrand, Van Dijk, Caulker and Soares. A pairing of Wanyama and Clasie made a double 6 at the base of midfield, with Wanyama deeper than his Dutch partner whilst Davis supported the attack in front of them. Sadio Mane was a threat from the right wing with Dusan Tadic operating on the opposite touchline whilst Graziano Pelle led the line centrally. With Mane putting the home side ahead within the first minutes, Liverpool got off to a slow start and took a bit longer to get into the game than their opponents. Southampton’s pressing did well to disrupt Liverpool’s building game and through an energetic front four they caused a few issues early on. This was not aided by a Liverpool shape which didn’t offer much support for the defensive line during deep possession and the block was commonly disconnected. Despite starting Sturridge and Origi in attack, they played many long balls due to the threat of Southampton’s front four without possession. When going forward, Southampton quickly showed their focus on attacking the wing of young full-back Randall. Not only did this lead to the first goal as an accurate cross from Liverpool’s right was met with a strong header from Mane, but the ex-Salzburg forward had the opportunity to double his side’s lead with another cross from Randall’s side. As the game progressed, Liverpool improved and their possession game became more effective. Albeit aided by a surprisingly weak Southampton, Lallana and co. created well behind Sturridge and Origi with Can particularly impressive from a right-sided central midfield position. Through the lateral movement of Lallana and the forward runs of both Can and Allen, it was clear to see that Liverpool’s attacks were oriented around the half-spaces. When met with the dropping movements of both Sturridge and Origi, they positioned themselves quite well around the two half-spaces and looked to break through in midfield. After the early attacks of Southampton, Liverpool managed to form a few threatening situations of their own from the half-space with Allen in particular moving high up the pitch down the left. Clop’s side equalised soon in the 25th minute and by the 28th they were in the lead – the second coming from an exquisite assist by Can – in the right half-space. The goal was a good example of the diagonality of the half-space as the ex-Bayern midfielder was able to play a diagonal through-ball into Sturridge after moving inside towards the centre. 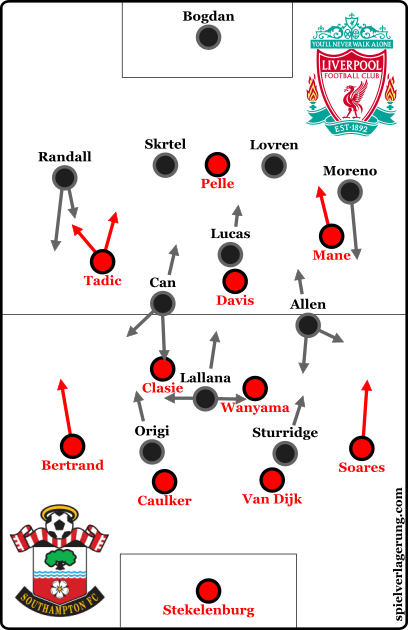 With quite a flexible midfield 4, Liverpool again looked improved with the ball as they positioned themselves well. Ere Can in particular made many ball-oriented movements as he could be commonly seen moving towards the left flank. The same can be said about Joe Allen though this was slightly later on in the match. Lallana’s movements were also important as he shifted horizontally between the half-spaces offering himself for passes beyond the Southampton midfield. The flexibility of the midfield movements created a versatile system which facilitated attacks in wider areas too, especially when the ball-near striker would shift towards the touchline too. Liverpool’s attacks benefited from the central focus and with most of the forays forward happening between the two half-spaces. Not only did the centre provide a better platform to carve out chances for the Liverpool forwards but the structural focus gave potential to create overloads against Southampton’s 4-4-2. This was particularly the case when one of Mane or Tadic would push up into the first line of pressure, leaving uncovered spaces across the midfield. Although their spacing didn’t really allow them to establish such overloads as often as they’d have liked, it did provide some success. At times the front 3 were too disconnected from the deeper midfield, whilst in build-up at times there weren’t enough connections around the ball. On quite a few occasions two midfielders would occupy the same space meaning that they struggled to generate the passing options necessary to progress the ball upfield. The more threatening occasions coming when Southampton were vertically uncompact which itself was common enough for Liverpool to profit in the final third. This central-focus immediately put them at an advantage over Southampton who were more wing-oriented when going forward. After the opening 10 minutes of the game, the Saints’ wide attacks offered little threat as their crosses amounted to little whilst Liverpool’s central attacks created better. Something which has been payed close attention to after Klopp’s appointment is Liverpool’s pressing game and how it has developed. The German coach’s former club Dortmund were famous for their ability to press and there has no doubt been attention payed towards the same aspects of Liverpool’s defensive setup. Immediately some of the more macro-level facets have seen changes, with their pressing become more compact and with better connections. Whilst there are still some amendments necessary on a micro-level, their pressing is already superior to the vast majority of the league. Against Southampton, Klopp’s team generally pressed in a 4-3-1-2 shape with Lallana just behind the two strikers. For the most part they were nicely compact with the front 3 in particular narrow as they looked to block passes towards the centre of the pitch. At times however, Lallana’s presence wasn’t necessary as the pairing in attack co-ordinated themselves well to force the ball to one side of the situational back-three thus negating the ball-far centre-back. Such moments show the improvements made since Rodgers’ sacking with Liverpool’s play in general showing a greater intelligence which is rarely seen in the Premier League. Although the 6-1 scoreline maybe slightly flattering on Klopp’s men, they still thoroughly deserved their win against a sub-par Southampton side. Sturridge’s performance was definitely an encouragement whilst the more tactically-based aspects again showed the continuous improvement since Klopp (and Buvac!) arrived at Anfield.